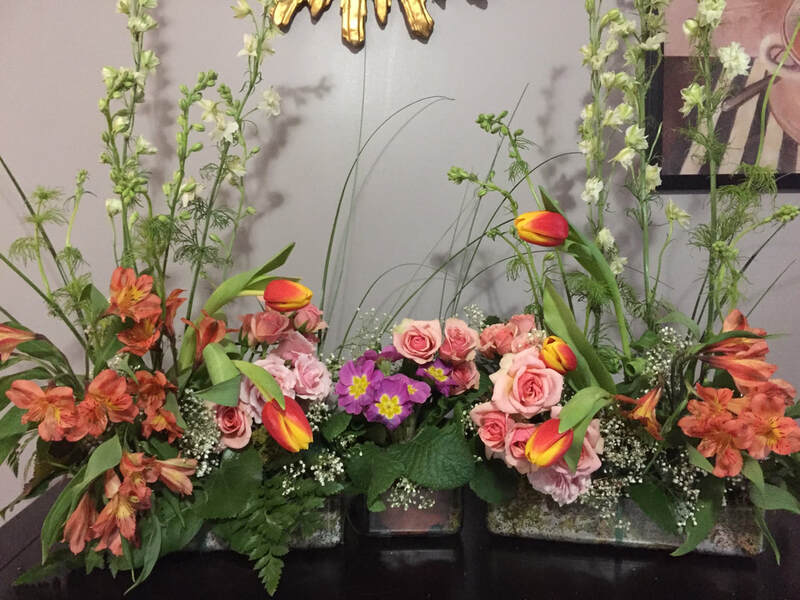 Floral Focus By Design is a studio florist in the Fairlington area of Arlington, VA.
​Call / text 703-829-5527 or email via Contact tab on this website - we look forward to hearing from you! If you call and we don't answer please leave us a voicemail - we will respond as quickly as possible. Events, classes, subscriptions - we offer them and much more! Fresh flower arrangements small to large including corsages and boutonnieres of course - see samples on the Gallery tab. Flowers are arranged in water, foam or wrapped. Custom Silk Floral arrangement design services available. Pricing: Fresh flower bouquets start at $35 plus tax and delivery. Delivery: $15 up to 10 miles, $1 per additional mile - free pick-up at our studio usually available by appointment. Please note that there may be additional charges if parking fees apply or security checks extend the delivery process. ​Same day delivery? Often, yes! Sometimes, depending on time of order and the type of flowers it may not be possible. ​Fresh flowers live only a few days - depending on the type it may be 3 - 5 days but there are others that may look good for up to 2 weeks. 1. Keep the water clean, i.e. replace when it looks cloudy or dirty or smells. ​2. When replacing the water, or anytime a stem is taken out of water it needs to be recut directly before it's put back into water. ​3. Flowers are often delivered in wet foam. Flowers depend on that water and the arrangement can be re-wetted by watering it like a potted plant. ​4. Don't put your fresh flower arrangement next to a bowl of fresh fruit as some fruit emits ethylene which makes some flowers age faster. ​5. Since not each flower in the arrangement lasts as long as the next one, take out those that look tired or wilted and the remaining arrangement will look fresh again. ​​It's sometimes hard to tell on a picture, but if you know the flowers in an arrangement you can often estimate the size.. If not, here is an attempt at sizing and pricing. ​A small arrangement is about 6 - 10 inches in height and in a small glass bubble or similar vase. Depending on the flowers used it will start at about $35 plus tax and delivery. 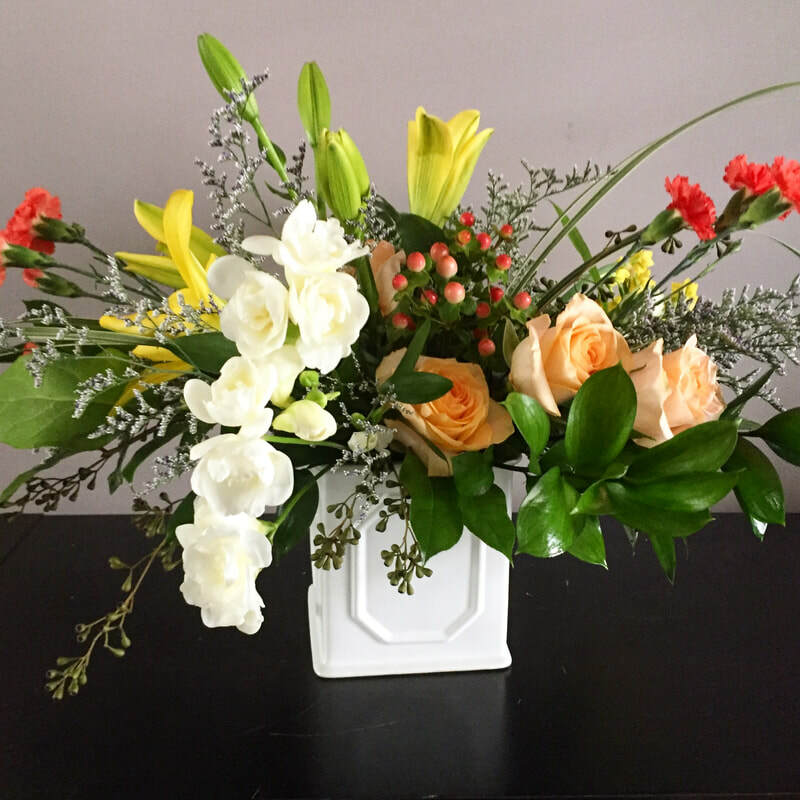 ​Medium arrangements are about 12-15 inches in height and average about $55 plus tax and delivery - again depending on the flowers that make up the bouquet. ​Larger size or more expensive flowers start at 18-24 inches in height and usually cost upward of $75 plus tax and delivery. ​These prices are estimates only. They vary with which flowers are available during a season, type and florists' costs - we pay more at times and therefore have to ask more. Discounts may be applied for subscribers, loyalty programs and charitable organizations.